PLEASE SIGN TO HELP STOP THE GENOCIDE OF A MINORITY NATION IN SOUTH AFRICA! Trump signs anti-genocide act into law on Monday, 14 January 2019! "U.S. President Donald Trump on Monday signed new bipartisan legislation committing the United States to preventing genocide"
"The Elie Wiesel Genocide and Atrocities Prevention Act aims to improve US response to emerging or potential genocides and deems the prevention of such atrocities a matter of national security interest." "It directs the Department of State to provide training to Foreign Service officers on preventing and responding to genocide and other atrocities through the establishment of an inter-agency Mass Atrocities Task Force." ANC, BLF and EFF you will soon be prosecuted for atrocities committed to white people in South Africa - you will soon be very sorry for openly challenging him! 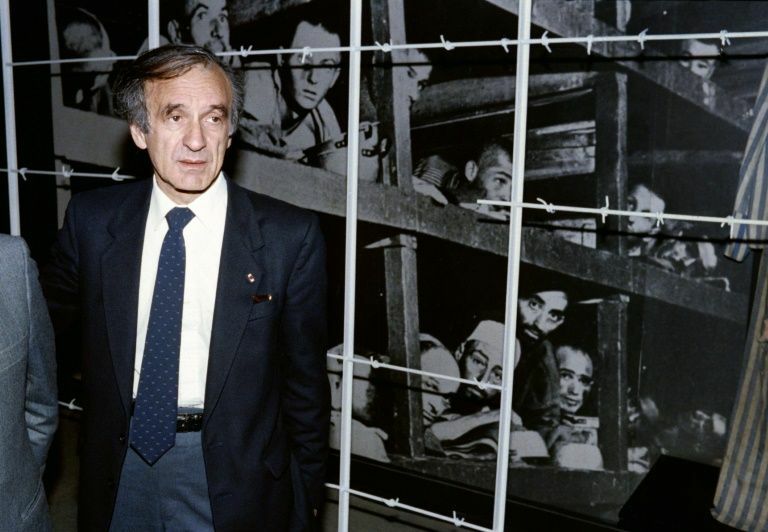 Nobel Peace prize winner and writer Elie Wiesel (L) in front of a photo of himself and other inmates, taken at Buchenwald concentration camp in 1945, during a visit to the Holocaust Memorial Center "Yad Vashem" in Jerusalem on in 1986 Sven Nackstrand (AFP/File) US President Donald Trump on Monday signed into law a bipartisan genocide prevention act named after Holocaust survivor and Nobel laureate Elie Wiesel, the White House announced in a statement.